Today I am going to begin a mini series looking at Dairy. I have been wanting to do a series on this for a while, because like meat, it is a bit on controversial topic. Health enthusiasts seems to be on two extremes, with one half telling you dairy is evil, that we are the only grown mammals who consume it, that its is unnatural and most of the world is intolerant to lactose anyway. The other side, the dairy lovers, will tell you that when you eat natural raw dairy it is very good for you, easy to digest, doesn’t cause intolerances, weight gain or health problems. Mmm, a tad confusing perhaps? 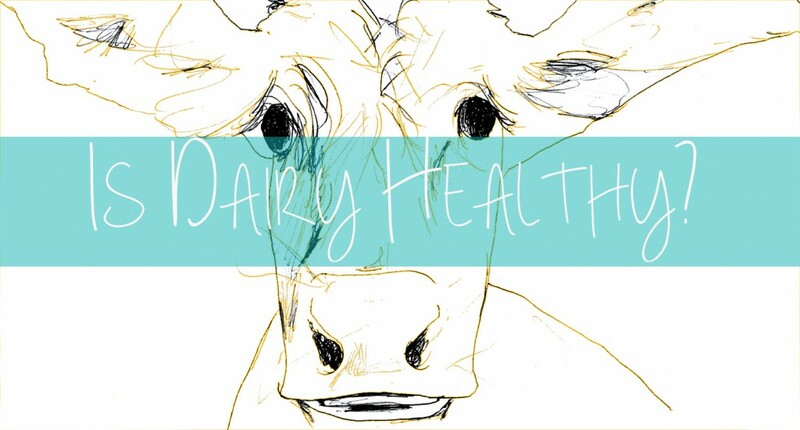 Today I am going to talk about what dairy is, my journey with it and generally bring some clarity to this confusing topic. When we think of dairy we tend to think of milk. The sole food of babies and the powerful substance that allows us to grow and develop into children then adults.It is made up of both protein and carbohydrates with roughly 8g of protein to 11.4g carbohydrates per glass of whole milk. Whole milk also contains saturated fat, some unsaturated fats and cholesterol. It is a complete protein – meaning it contains all the essential amino aids we need each day, it contains calcium and other minerals like phosphorus and potassium plus those fat soluble vitamins of A, D and E – which are brilliant for your skin, energy levels and overall health. Often dairy comes from highly processed and chemically alter sources, where animals are kept in inhumane conditions, given chemically altered food or food which are unnaturally for there bodies. Dairy contain lactose which is a sugar that many people are intolerant to, plus it causes a insulin spike in the body when consumed . Most shop bought diary is filled with hormone, antibiotics, chemical and has undergone heavy processing in order to get it to the shop shelf. If you want to find out more and download a report about modern treatment of cows just click here. Plus all those Paleo eaters out there will say that eating diary is a relatively new addition to out human diets therefore should be avoided. As clear as mud. So today I will share with you my experiences of being dairy free and dairy full. As a teenager I cut out dairy as I felt it helped with my stomach and digestive problems. I switched to mainly soya and avoid dairy as much as possible except for probiotic yogurt which i ate regularly. It helped me feel less congested or muscusy, in fact I went off the taste of milk entirely. It seemed to help my tummy, and help me feel a bit cleaner and less bloated. I also found it helped with the occasional eczema I got. I drank a lot of soya milk instead, which I will discuss on a later post and avoided cheese like the plague. Then about 2 years ago I started to hear about raw milk, milk that has not been pasteurised or homogenised in any way, basically straight from the cow milk. I was living in England at the time were it is legal to buy raw milk for non commercial use, where as in Scotland were I grew up it was illegal to sell raw milk in any form. I read about how some people could handle raw diary better and how when dairy is not messed with all the natural enzymes in milk remain making it easier to digest. Also started to really learn about fat and how many vitamins are found in fat and how it help curb the insulin spike of sugar. So slowly I introduce raw diary. I actually began to drink milk, have organic raw cheese and make dairy kefir. I am still on a journey of what my body actually loves and needs in regards to diary. I was consuming milk and loving it, but felt like it wasn’t doing me good so I removed it from my diet but kept on eating the kefir, butter and cheese (see below for why). The result? Well I have surprised to say that my nails and teeth are looking better than they ever have and it no longer upsets my stomach or makes my sinuses congested. Curious! It seems I have gone from dairy hater to dairy lover. Obviously I have made other massive changes to my diet over the year which will factor in (I am now grain free read here for my story) but generally feel good about eating dairy product. I choose not to drink milk as I cant get hold of raw milk in Scotland plus I just don’t think my body likes it that much. Sounds weird but just being honest. I am still figuring it all out but I save milk now for occasional treats – mainly when I want a beautiful flat white from an artisan coffee house or custard! Like with lots of what I say the main thing is really for you to learn to listen to your body. Do I think we should all be dairy free? No I don’t, but I totally acknowledge being dairy free (pretty much) for 6ish years did me good. Do I think we should consume loads of dairy that is readily available at the shops? No I don’t as it comes from unhappy cows that are producing toxic milk that will harm our bodies in excess. Still confused? Below I write out the difference in the different dairy products and why I choose certain ones. Bog Standard Milk. If standard shop bought it will not contain any of the natural enzymes to aid digestion, cause sugar levels to spike, and worse still for those semi or skimmed buyer, will have a reduce availability of those fat soluble vitamins of A D E. Standard milk will also contain hormones, left over of antibiotics from the sick cows and other chemicals. Raw Milk. Is in its raw state which means it could contain harmful bacteria but if the animals and farm is run correctly and naturally this should not be the case. It reduces the insulin burst, is more digestible, more natural and therefore better for you. It also help support local farmer and traditional ways of farming. Want to read more about raw milk? Read this? Me – I live in scotland so raw milk is not an option unless I want to spend lots of money ‘importing’ it in, plus I don’t think my body like too much dairy so u feel better without lots of milk. I use organic milk to make my kefir, eat organic or raw cheeses and eat organic butter. As I listen to my body this may change but at the moment this feels good to me. In the future i want to own a goat and get all my milk from it! Not an option for our flat however…! Average cheese. It is just milk/cream that have be allowed to ferment over time with added bacteria strains, meaning the bacteria has been ‘eaten’ up most of the lactose (sugar) . Again if you buy standard cheese it will be the product of an unhappy cow, who was mostly likely to be sick and pumped with drugs and growth hormones to get it to produce unnatural amounts of milk. Me . I eat organic cheese, and currently I just get it from the supermarket as I have yet to find a more local/bulk buy. I am loving eating cheese but perhaps indulged in to many cheese boards when on holiday so I still aim to eat it in sensible amounts. Organic or raw butter. Similar as above in it benefits as it in a very natural form. it also have a very small amount of dairy in it so great for those who are lactose sensitive. Me. I bake with butter (or coconut oil) and use only organic stuff and spread it liberally over my Pumpkin Bread. There really is hundreds of arguments that are for and against dairy consumption. I will look in more detail at a few in future posts. But I have been on both sides of the fence and I can honestly say that it really is about listening to your body, what it needs and is communicating with you. If you get bloating and pain when you eat dairy you body is telling you it needs a break so why not remove it from your diet? Our bodies are amazing healing machines – mine is a good example. Dairy free for 6 years and my body can now handle dairy pretty well. My belief is that our bodies are designed by an amazing healer (God) and are design to for healing and restoration. So maybe you are a staunch dairy eater. Why not think about going organic? It will support natural farming, do you own bodies hormonal balance wonders and ensure you are not getting nasty chemicals. If you are strictly dairy free stay tuned for my homemade milk alternatives, the danger of ‘dairy’ alternatives and make sure you eating lots of vegetable and maybe consider adding dairy kefir to you diet to boost calcium and probiotic content? Go for quality . Buy only organic dairy and just reduce your consumption if the budget is tight. Consider adding dairy kefir to your diets. Ensure you eat lots of green leafy vegetable and nuts for calcium. Listen to your body – what are your symptoms telling you? Make small changes accordingly. What are your experiences with Dairy? Are you dairy full or dairy free? 1. Wellness Mama -inadvertently has the same title!